One of the most common practices in hydroponics is to use reverse osmosis (RO) water in order to create your hydroponic nutrient solutions. This water is made by running another water source - most commonly tap water - through a reverse osmosis system that removes a very large portion of the ions within the initial water source. The RO process is very energy intensive and also uses a large volume of water, only around one third of the water input ends up as RO water while the rest ends up as a more highly concentrated solution. Today we are going to discuss whether using RO makes the most sense, when it doesn't and how you can make sure that using tap water does not cause you any important issues. The idea behind using RO water is to have the best "base" for the construction of a nutrient solution. If your water starts up with some substances within it then the amount of control you have over composition is limited and therefore your results might suffer because of that. If for example your nutrients add 150 ppm of Ca but your water already contains around 40-60 ppm then adding so much Ca might place you within a suboptimal spot. If your water contains a lot of carbonates, sodium, fluorides or other substances they can also cause significant problems within your hydroponic crop. Using RO water brings a "clean slate" that ensures that what you add is what you get. So what is wrong with RO water? There are two main issues with using RO water. The first is that it's a very energy intensive process - therefore a costly process - and the second is that the waste products of the RO process can create environmental problems. Additionally tap water already contains many nutrients necessary for plant life - mainly Mg and Ca - so why would you remove these elements only to later add them again later on? Surely you would rather save the energy from the RO process and use the nutrients within your water as part of your nutrient solution. 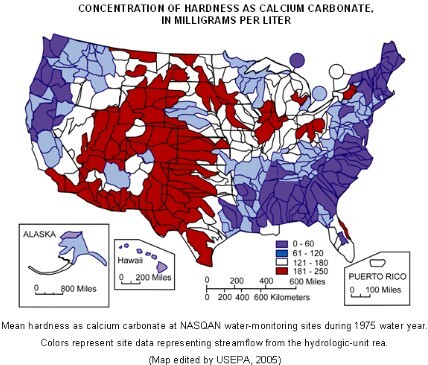 The above map shows you the mean hardness of water (as ppm of calcium carbonate) across the United States. The people with the highest Ca concentrations have around 100ppm of Ca while those who have the least have around 0 to 24ppm. This means that for the people with the highest Ca, the Ca from tap water could contribute more than 50% of the Ca needed by a flowering crop while for the other states the contribution would be rather small. If your water is high in Ca then chances are it is also high in Mg so performing a water analysis will be necessary. From my experience with customers Mg is usually around one fourth to one third the concentration of Ca in solution, but the proportion can change significantly depending on the zip code. The table below shows the Ca/Mg content of water sources at different overall hardness levels in Germany. Mineral content in water also changes substantially as a function of temperature since rocks that contribute Ca/Mg carbonates will be more soluble during the warmer months of the year. It is therefore ideal to get two analysis, one during February - usually the coldest month - and another during August, the hottest month, to get a good idea of the range of Ca/Mg concentrations that you will be getting in your tap water. This will allow you figure out how to adjust your nutrients as a function of the average temperature where you live. Carbonates are also something you should worry about, if you have a high water hardness you might have more than 150ppm of carbonate within your nutrient solution. This is not ideal since carbonate ions can cause issues in your crop. To deal with this you can simply work at a slightly more acidic pH (say 5.6-5.8) this will limit the amount of hydrogen carbonate ions that can be present within the water as it will shift the equilibrium significantly more towards the evolution of carbon dioxide (since carbonic acid in solution is in constant equilibrium with atmospheric carbon dioxide). There are however some circumstances where using RO water is unavoidable. If you water contains more sodium than your crop can deal with (read here for more info), more than 50 ppm of chlorides or if there are more than 10 ppm of fluoride then you will need to use RO water because those elements in those quantities are not going to be good for your plants. If these elements are absent or in low enough quantities then there is no reason why you would want to use RO instead of tap as using RO would be an unnecessary energetic and environmental expense given that you can just compensate for the ions already within your water through adjustments in your nutrient solution. Is rainwater appropriate to use instead of tapwater? I have started to use it in my autopots for chili and tomatos. We get plenty of rain in Ireland. My only concern with it is that I have some lead flashing on the roof. Thanks for writing. Yes, rainwater is ok. Lead flashing won't dissolve significantly if your rain water pH is close to neutral. In any case I would paint over the flashing to ensure it doesn't leach, which might be a possibility if your rain is acidic.